For those with a sweet tooth for rich culture, exciting attractions, and, of course, delicious chocolate, Hershey, Pennsylvania has endeared itself in the hearts of many as the “The Sweetest Place On Earth.” But the name Hershey means more than the sweet confections Milton Hershey first crafted starting in the late 1890s. Building on his beliefs and passion for serving his employees, their families, and the community in which they live and work, Hershey Entertainment & Resorts (HE&R) has partnered with The Crayon Initiative to benefit the environment and help sick children at local hospitals. “It’s rewarding for HE&R to know the crayons we’re sending to The Crayon Initiative ultimately will be in the hands of children in hospitals throughout the country. Recently, it was exciting because the crayons came full circle as our local children’s hospital, Penn State Health Children’s Hospital, received their first shipment of crayons from The Crayon Initiative,” says Melissa Stradnick, Public Relations Manager atHE&R. Stradnick learned of the organization from the company’s former Director of Corporate Social Responsibility who caught wind of a mother-daughter duo at two of HE&R’s restaurants recycling discarded crayons left on tables after meals. 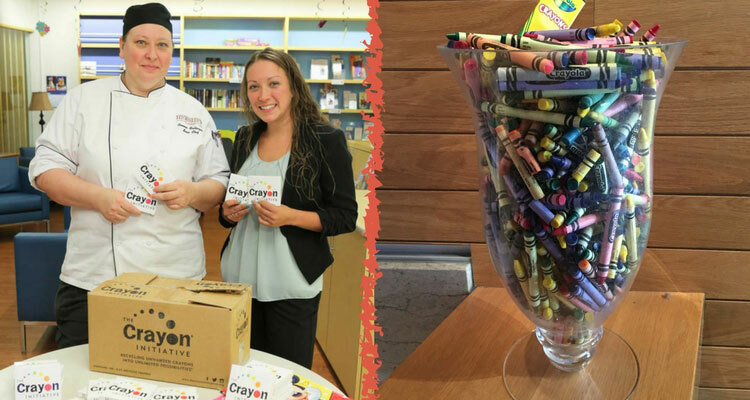 “I originally heard about The Crayon Initiative through my mother, Sous Chef Connie Fallinger, when she started the collection process at Hershey Lodge resort and convention center,” says Caitlin Ensminger, Assistant Manager, Beverage, at The Hotel Hershey resort. “I think this hit home for my mother and I, as my cousin had battled with cancer at a young age. Our company takes part in a lot of green initiatives and this was just another way we could participate.” Currently, all nine of the HE&R restaurants participate in collecting crayons. Each restaurant outlet takes ownership in collecting the used crayons. Once their bins are full, Ensminger, Fallinger and other restaurant managers collects them, places them in shipping boxes, and sends them out.